Pseudoarthrosis is a term used to describe what happens when a spinal fusion is unsuccessful. 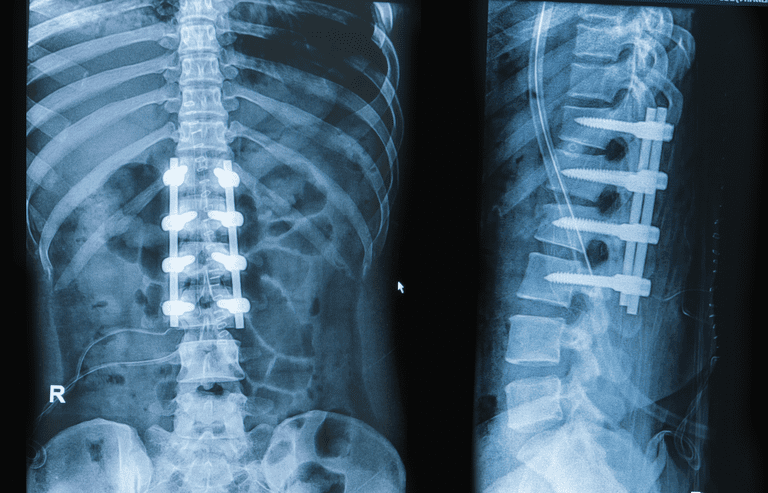 Spinal fusion is a type of back surgery given for a variety of problems including but not limited to Scoliosis curve correction, disc problems and/or weakness or instability in the spine (which can be infection or tumor). The ultimate goal of a spinal fusion is to reduce pain and improve function. For spinal stenosis and/or radiculopathy, the goal to decompress, or make room for, nerves and/or the spinal cord as they pass through spaces in the spinal column. According to the American Academy of Orthopedic Surgeons (AAOS), spinal fusion is essentially a welding process. The idea is to join neighboring, painful vertebrae together and, with time, allow them to fuse into one single, solid bone. The AAOS says that (often along with "instrumentation" such as rods, screws, and/or wires) all spinal fusions involve placing some type of bone material into the space between the vertebrae that will eventually grow together as a solid unit. This material is called a bone graft. The AAOS says the graft increases bone production and stimulates healing and fusing. But what happens if the spinal fusion doesn't take? Doctors refer to this as a "non-union" or pseudoarthrosis. In cases of non-unions, not enough bone formation occurs during the mending period immediately following the procedure. In general, poor bone healing is what leads to pseudoarthrosis. Sometimes this is due to planning and/or what goes on during surgery; other times it's because of things you bring to the table such as being a smoker or taking steroids. Why? Because smoking can lead to a 33% decrease in the rate of fusion, according to surgeons Steven Ondra and Shaden Marzouk in their article "Revision Strategies for Lumbar Pseudarthrosis" published on the Medscape website. They say the reason is that smoking constricts your blood vessels as well as reduces the amount of blood vessel growth into the site of the fusion. To be successful, fusions need the blood that new and existing blood vessels (with normal diameters) can deliver. Inflammatory arthritis Is this a revision surgery? On the surgical side, the Scoliosis Research Society says that even in the best of surgical hands, the risk for pseudoarthrosis is at a minimum of 5% - 15%. Surgeons must take into consideration specific and overall biomechanics, the condition of the grafted "environment" and other things. As far as what to use for a bone graft is concerned, while numerous possibilities exist, including manufactured bone graft, experts agree that using the patient's own bone (called autograft) is best. But this is not always possible. It depends on things like your underlying health, what the graft site (i.e. your hip, spine or another area from which the bone is taken) is like, if the use of instrumentation (i.e., rods, screws and/or wires) is planned and if the fusion will be done in front or in back. Generally, an anterior column fusion (anterior means front and column refers to the vertebral bodies stacked to make up your spinal column) is more successful. Even with all these variables, if you've had a pseudoarthrosis before and are going through revision surgery, using autograft material is a must. Doctors often have a difficult time diagnosing a pseudoarthrosis. One reason for this is that you may or may not notice symptoms. Another reason is that no one can say for sure how long after your spinal fusion surgery any related pain or other symptoms may occur. You may feel pain from pseudoarthrosis months or even years after your spinal fusion surgery. And finally, sometimes a pseudoarthrosis is just a very tiny crack in the bone, making spotting it on a film difficult, if not impossible, for the reading radiologist. Treatment for pseudoarthrosis will likely start conservatively with medication, physical therapy or pain management. If that fails to satisfactorily relieve your symptoms, your doctor may suggest revision surgery.